I was immediately covered in goose bumps and it dawned on me that my little girl had just given me her own gift wrapped present: a message for 2018. I looked it up – synonyms for possibility include: probability, hope, promise, potential and choice. A strong word filled with the promise of so much potential…just like all our new grade 1 learners at the start of their school careers. Welcome back to school! It really remains one of my favourite things: greeting all the beautiful children at the gate on the first day of school, eager for another year of adventurous learning here at our school-on-a-farm. Hayley Davis is our newly appointed Academic Manager, leading the College of Teachers in steering and implementing the school’s pedagogic direction. Hayley was a class teacher in the primary school for the past ten years, has been managing our school’s compliance in terms of our IQAA and Umalusi accreditation and also has two children in the school. Crystal de Moore will be the class guardian for class 2, taking over from Hayley. Martin Coetzee has been appointed as English Home Language and social science teacher for the middle school. Denni Raubenheimer will be teaching natural sciences to the middle school learners. We wish you all success in your new positions, and a very warm welcome to our three new staff members. Save the date: Bring & Braai on Friday, 2 February, starting at 17:00. This is a highlight on the school’s calendar and all parents and learners are invited. Annelie Franken will conduct a Parents’ Workshop over two Saturday mornings about child development from age 0 to 18 years, and how the Waldorf curriculum ties into it. All parents are urged to attend these workshops on 27 January and 3 February as it provides critical background information to why we teach the Waldorf Way. Please RSVP before Thursday, 25 January if you are planning to attend these workshops by sending an email to zelde@thewaldorfschool.co.za. Annual General Parents’ Meeting on Wednesday, 28 February. A music concert, directed by Christian Radovan, will be held on Sunday, 18 February in the Packhouse at Rosemary Hill. Christian and his talented jazz students will perform big band sounds from the 1930s, 40s, 50s and beyond. See the write-up and events poster below. This is going to be a very special performance not to be missed! A letter will be sent to the bus parents soon with regards to the specific buses on the routes and the bus drivers’ contact details. We ask that you please save these numbers on your phone and let the bus driver know if you are running late or if your child will not be attending school. This ensures that the buses stay on schedule. Apart from our regular emails to the parents, we publish two digital newsletters, Max Stibbe Matters and The Kindergartner. These newsletters contain important updates, information, interesting articles and give parents a visual impression of what our children get up to at school. Keep the school office informed if any of your contact details change during the course of the year. We would like to take this opportunity to remind all our parents and guardians that the Waldorf Way relies on parent involvement and open lines of communication. We urge you to build a strong relationship with your child’s class teacher so that we can ensure that each child’s interests are always looked after. If there are any queries or concerns, your class teacher should always be consulted first. Most classes have WhatsApp-groups to keep parents regularly updated. Please observe the rules of each group and be mindful not to send messages before 06:00 in the morning or after 21:00 at night (unless it is an emergency). Bear in mind that teachers are not always able to answer their phones during school hours. If you have an urgent message for the teacher, or an emergency, please contact the school office first. We encourage you to sign up for the MySchool-programme (joining is free!) so that the school can benefit from your purchases at Woolworths and other participating partners. Please visit www.myschool.co.za and follow the easy-to-complete application form. Every contribution helps! Our school has a loyalty programme with Makro Silver Lakes. 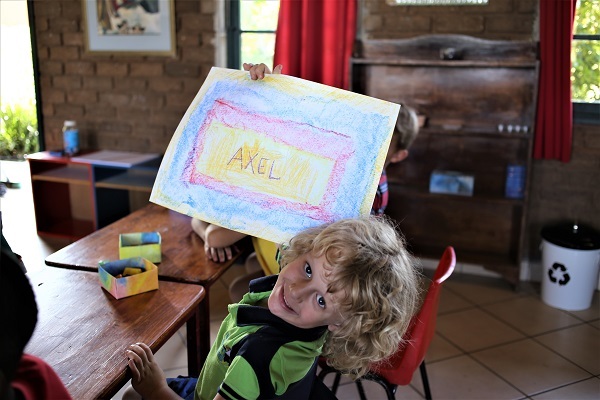 Please support us by linking your Makro card to The Waldorf School at the info counter, or by sending us your Makro card number and we will do it on your behalf. A big fundraiser has been scheduled for the second term. Please diarise the date: parent involvement and attendance are very important at these events. It is imperative that you attend Parent Updates, festivals, plays and other important events. These are all part of the memories your child is creating and your involvement at these events demonstrates your support and encouragement in your child’s life. Our swimming pool has been cleaned, painted and is ready for use! Check with your class teacher on what days your child has Games period with Shad and make sure that they have their swimming clothes packed. The children enjoy the relief of the cool water on the warm summer days we are currently experiencing. Swimwear for girls is a full costume with or without board shorts. Boys must wear swim shorts/board shorts. Protective swimming tops may be worn, but no cotton clothing may be worn over swimming costumes while in the pool. We are very proud to announce that Rosemary Hill Stables have opened their barn doors and are ready to start horse riding lessons! See contact details and lesson prices on adverts below. Best wishes to you and your loved ones for a blessed 2018 filled with endless possibilities.